​We have put together a few links and videos together below to help our coaches. ​If any coaches have some training material they would like to share please contact the Site Administrator so we can update our site. This guide contains player skill areas with levels standardised against age and is a useful guide when deciding on age appropriate skill development drills to be used at training for players in their care. To find out what skills you should teach your team based on their age group, click here. What can i teach my kids? 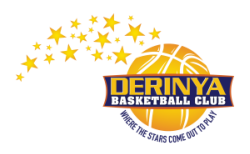 During the Summer 17-18 basketball season, the training venue provided is the Derinya Primary School indoor basketball court. To find out when your team trains, click here. When does my team train?